Come and sign up to decorate the Chancel! It's fun, and you can be as creative as you want. Decorations don't have to be limited to flowers. 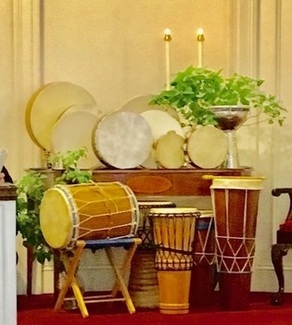 People this past year made beautiful arrangements ranging from baskets, to photography, to tapestry to drums. If you’d like a dedication printed in the Order of Service, email [email protected] by the Tuesday before the Sunday date you’ve chosen. For example: “Chancel flowers (or Art - decoration) are provided by "your name or group" in memory [or in honor] of ________________. One or two short lines is best. Large vases are available in the back hall closets in the Meeting House or you may use your own. Remember to take your vase home afterward. Check the church schedule. If there is a wedding on the day before service, please install the decoration by 9:30AM that Sunday. Otherwise, you can bring your decoration to the chancel earlier. If you need help installing your decoration, call Marianne Orlando (508 875 4552) a minimum of 2 days in advance so she can reserve a time to help you. Winter Holiday Decorations: The chancel is decorated by a committee mid-December, and the decorations stay up until the first of the year. We welcome helpers. It's lots of fun and you get to meet other First Parish members. Ask when it is happening this year. Celebrate an anniversary, a season or a holiday, make an expression of gratitude, honor your grandparents, make a display just because you want to create something! The possibilities are endless. That is up to you – you can bring in flowers from your home or garden OR have a florist make your arrangement for a range of $25 - $85 per arrangement. A simple arrangement of flowers in a vase works, but remember the Meeting House is large, so decorations need to be visible from the back of the church. You can set a vase on a block or stand to help create interest and make your arrangement even more striking. Chancel Sunday: Pick a Sunday to decorate the chancel! Signup will be in Scott Hall. The flowers today are provided by Rev. Judy Mannheim to honor and thank First Parish, on the Fiftieth anniversary of my membership.